July 5, 2011  If those demanding reform choose to ignore President Bashar Assad's call for a "national dialogue," reforms will be made without them, Foreign Minister Walid Moallem says. July 5, 2011  Residents and activists are reporting about what's happening. The Assad regime has said that the violence is being sparked by some in the crowds of protesters. June 28, 2011  Bouthaina Shaaban, an advisor to President Bashar Assad, makes the rounds to make the case that protesters are right about the need for reforms — and to dispute reports that the Assad regime is targeting opponents. June 20, 2011  Analysts say the Syrian president offered vague promises for reform, while also making clear that his regime will continue to hold a hard line against dissent. 'Children's Friday' Protests Called In Syria; Internet Access Cut? June 3, 2011  Opponents of the Assad regime are using the alleged torture and death of 13-year-old Hamza Ali al-Khateeb as a rallying cry. But now, the government appears to have cut off access to the Web — a vital tool for spreading the word about protests. May 31, 2011  The boy's family allowed an activist to make a video of Hamza's body. His family says he was tortured and mutilated by forces loyal to the Syrian regime. 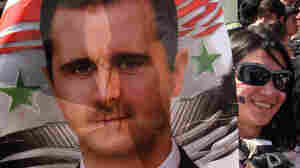 Now Hamza is being used by opponents of President Assad as a rallying cry. Syria's Assad, Six Others, Hit With Sanctions By U.S.
May 18, 2011  It's hoped, the administration says, that the moves pressure the Assad regime to "end its use of violence against its people and begin transitioning to a democratic system that protects the rights of the Syrian people." May 10, 2011  President Bashar Assad and his supporters "must accept a political change" that leads to a multi-party form of government, says writer Yassin Haj Saleh, who was kept in prison by the regime for 16 years. Syria's people, he says, will accept no less. April 25, 2011  "The brutal violence used by the government of Syria against its people is completely deplorable," says spokesman Tommy Vietor. "The United States is pursuing a range of possible policy options, including targeted sanctions." March 29, 2011  The Syrian leader would remain in place. He's hoping that concessions will satisfy protesters, who have raised the most significant challenge yet to Assad's rule.